This is the fourth in a series of articles tracing the creation of Norsaga’s artwork. To see where it ends up, check out the gallery on the main site.The last of the primary-colored heroes are the blue Lore heroes. 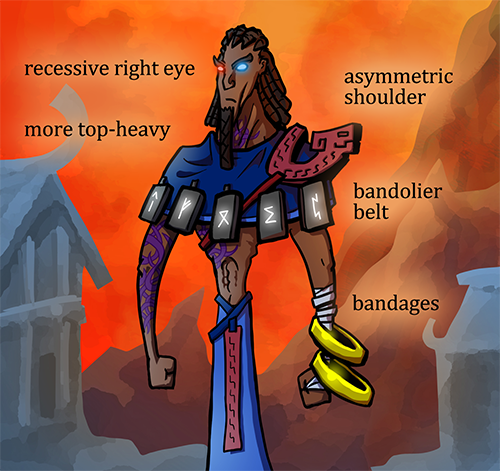 If the dominant colors align with races or clans within the peoples of Norsaga, blue encompasses the cold, mystical, iron-willed people who have subjugated magic to their whims. Physically they tower over the other colors, and their glowing eyes are immediately distinguishing. Their swirling tattoos are generally themed around each individual hero's class, with Witches featuring snakes and ravens hidden in the designs. 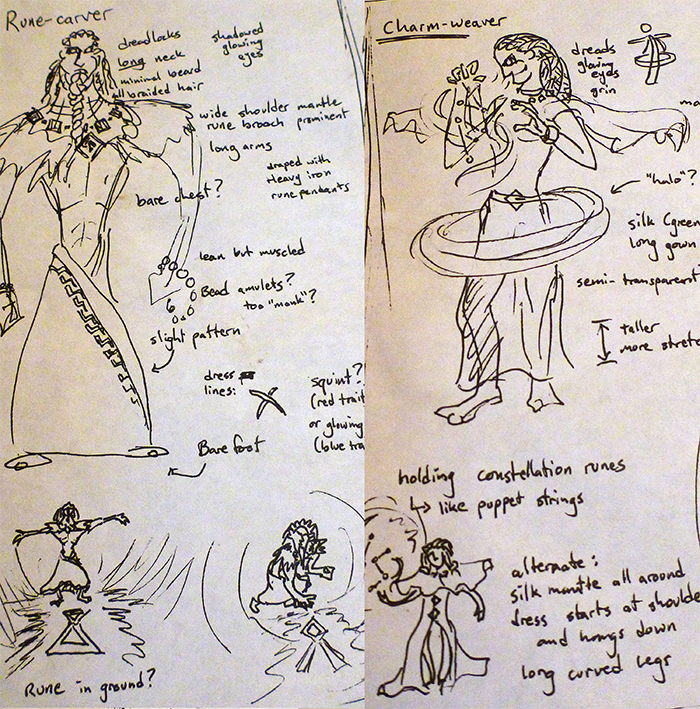 Above is the original concept for the Charm-weaver, with a distinctly blue body and hairstyle, before the Spirit-walker took over as the fourth Lore class. 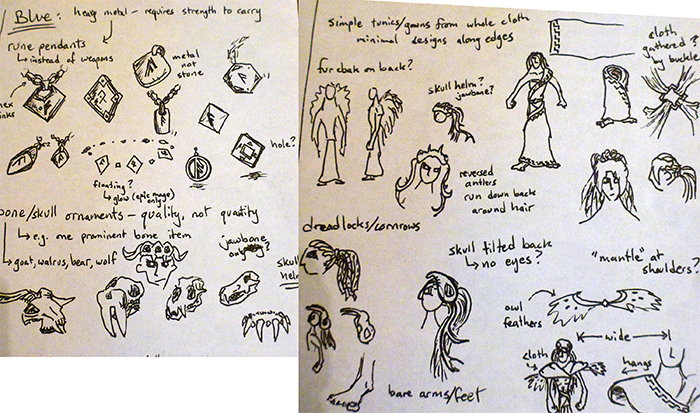 While I deviated a lot from Kevin's sketches for these heroes, I used his Rune-carver almost unchanged. That's it for the designs of the four primary Norsaga hero colors. Yellow, stocky and burdened with armor, pouches, and chain mail. Red, with huge scar-covered arms, bandaged bodies and fur-trimmed pauldrons. Green, lanky and cloaked, with feathers and knives belted everywhere. 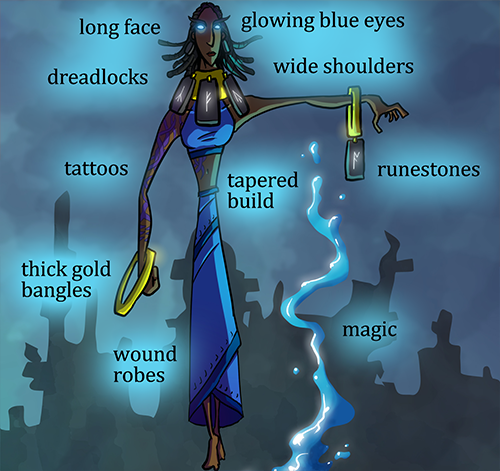 Blue, robed and covered in tattoos, gold, and glowing runes. The next article will cover the Ghosts and Skalds to finish out the hero designs. This is the third in a series of articles tracing the creation of Norsaga’s artwork. To see where it ends up, check out the gallery on the main site. The green Craft heroes are the tricksters and thieves of Norsaga, and from conception their designs were full of curves and motion. Their costumes are also some of the most intricate, featuring lots of belts, layers, and swishy bits (technical term, and my least favorite thing in terms of shading). Due to the number of buckles, Kevin's concept pictures got used a lot while drawing green heroes. So did things like knife hilts and arrow heads; designing these little details takes more time than you'd believe. Above on the lower-left is the original Spirit-walker concept; besides being female it was a green hero, before being traded to blue for the Charm-weaver. You can also see a female Hunter design. Coming up next, the design of the blue Lore heroes! This week, MM creator Daniel Zayas interviewed Kevin about the design process for the game. You can read the interview here, as well as other interviews with cool people, since Daniel does this regularly! The interview contains some great questions from Richard Ham (Rahdo Runs Through), Gordon Calleja (Posthuman), and Seth Johnson and James Ernest (Titans of Tabletop). They all have cool projects currently on Kickstarter and worth checking out. Norsaga is now live on Kickstarter! Shipping is only $1 to the US, Canada, and EU, $5 to the rest of the world. For international backers, the shipped game will be below VAT and duty thresholds so you won't get hit with those fees. If you want to do even more to help us fund this campaign and maybe unlock some exciting stretch goals, you can share the announcement on facebook and twitter.